Explore and understand early church personalities, writings and history. By Christopher A. Hall. In Reading Scripture with the Church Fathers and Learning Theology with the Church Fathers , Christopher Hall brings a unique focus and clarity to the writings of the early church fathers. He starts by acknowledging that the ancient writings are not easily accessible due to the linguistic, political, social and philosophical climate of the time. 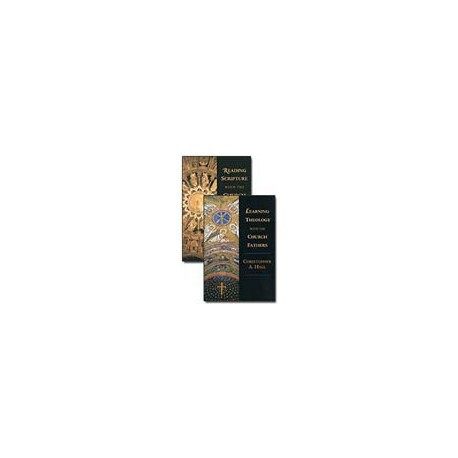 The goal of this two-volume set is a clear exposition of biblical interpretation and how it informed the development of early theological positions on topics such as: the Holy Spirit, sin grace, redemption, suffering, providence, the church and the resurrection of the dead. In Reading Scripture with the Church Fathers, Hall points out the ancient fathers heard music in Scripture where contemporary readings remain tone-deaf. Despite their occasional eccentricities, their hearing is refined through long listening in song, worship, teaching, meditation and oral reading. They challenge and correct modern assumptions as they invite close examination of the divine melodies of the Bible. Reading Scripture with the Church Fathers is an exceptional guide. It provides a warm, winsome, informative and indispensable introduction to explore who the early leaders and scholars were, how they read and interpreted Scripture, and how modern readers can benefit from their wisdom and insight. After the completion of Reading Scripture with the Church Fathers , Hall realized there were still vast areas untouched in understanding early church writings on key theological topics and their intersection with Christian spirituality. Learning Theology with the Church Fathers is a concise guide to getting the most out of the church fathers for contemporary application. For example, in chapter 1, there is a discussion of the difficulty some modern readers have in addressing God as “Father.” Hall points to how Athanasius might coach those struggling in this regard. The early church fathers were great theologians--though they did not think of themselves as such. They were working pastors, involved in the daily life and leadership of their congregations. Yet they were wrestling with many of the great and formative questions of the Christian faith, such as the Trinity, the incarnation, the providence of God and the nature of the church. These beliefs were defined in the crucible of spiritual leadership, pastoral care and theological conflict, all set against the background of the great cultural movements and events of their day. For the church fathers, theology was a spiritual exercise woven into the texture of life. Learning Theology with the Church Fathers offers unique focus on the great questions of theology from Christopher Hall's mastery of early church history and culture. It, combined with Reading Scripture with the Church Fathers will help you read Scripture with a first century passion and find greater appreciation for the foundations and architecture of our Christian faith. This collection will also give you the key insights to get the most out of the Early Church Fathers 38-volume collection, now included in the Complete , Advanced and Professional Reference Libraries .